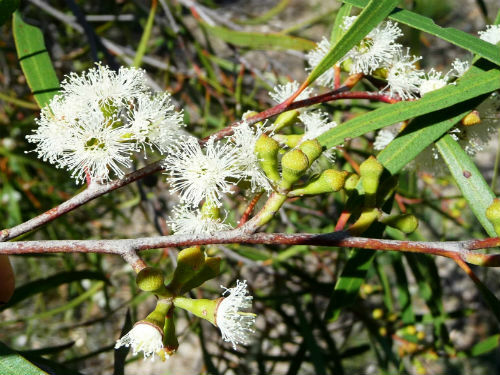 Eucalyptus apiculata, the Narrow-leaved Mallee Ash, is a small tree that will reach a height of six metres. In the wild, probably due to bushfires, plants may develop a multi-stemmed (mallee) growth habit. Cultivated specimens usually make do with a single trunk. Bark is smooth, white or grey-green and shed in strips. Leaves are narrow, very pointed, glossy green and up to 12 centimetres long. Buds are carried in clusters of seven with conical caps and covered in small warty lumps. White flowers appear between August and October. Fruits are urn-shaped with enclosed valves. E. apiculata is classified as rare. Although the species is widely distributed it only occurs in small, scattered populations. Some populations are protected in reserves. The Narrow-leaved Mallee Ash occurs in the Blue Mountains and Southern Tablelands of NSW. E. apiculata is an attractive small tree that is small enough to be accommodated in suburban backyards. The Narrow-leaved Mallee Ash was named in 1902 from material collected near Berrima, southern NSW. The species name is from the Latin apiculatus, ending abruptly in a point and refers to the leaves.